Soon afterwards, according to Wiesenthal’s account, he managed to walk 170 miles west to Chemnitz after Gross-Rosen was evacuated. Walking on a gangrenous foot with a recently amputated toe would have been hellish. Instead of a shoe, he had the sleeve of an old coat wrapped around his foot with some wire. For a walking stick he had a broomstick. Of the 6,000 prisoners who marched out, only 4,800 arrived in Chemnitz. With his infected foot, Wiesenthal was lucky to be among them. From Chemnitz, the prisoners ended up at Mauthausen camp near Linz in Austria. 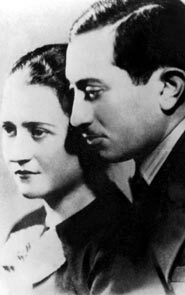 Wiesenthal arrived there on the frozen night of February 15, 1945. In The Murderers Among Us, he tells how he and a fellow prisoner, Prince Radziwill, linked arms to make the last four miles uphill to the camp. The effort was too great and they collapsed in the snow. An SS man fired a shot that landed between them. As the two men did not get up, they were left for dead in the sub-zero temperature. When lorries arrived to collect those who had died on the march, the unconscious Wiesenthal and Radziwill were so frozen that they were thrown onto a pile of corpses. At the crematorium, however, the prisoners unloading them realised they were alive. They were given a cold shower to thaw out and Wiesenthal was taken to Block VI, the “death block” for the mortally ill. In 1961, when Wiesenthal was interviewed for the Yad Vashem archive by the Israeli journalist Haim Maas about his war years, Wiesenthal mentioned that the infection from his foot had now turned blue-green and had spread right up to his knee. He lay in the death block for three months until the end of the war. Too weak to get out of bed, he claimed he survived — incredibly — on 200 calories a day, along with the occasional piece of bread or sausage smuggled to him by a friendly Pole. Mauthausen was liberated on May 5, 1945. Despite weighing just 100lb, Wiesenthal struggled outside to greet the American tanks. “I don’t know how I managed to get up and walk,” he recalled. If he was able to walk, his severely infected leg must have been cured during the previous three months by either amputation or antibiotics. We know the former did not take place, and the latter was emphatically not a common treatment for ailing Jews in Nazi concentration camps. Once again, it appears as though a miracle had taken place. The rapidity of Wiesenthal’s recovery is so astonishing that it is doubtful whether he was as ill as he claimed. Just 20 days after the liberation, he wrote to the US camp commander asking whether he could be involved in assisting the US authorities investigating war crimes. Claiming to have been in 13 concentration camps — he had in fact been in no more than six — Wiesenthal supplied a list of 91 names of those who he felt were responsible for “incalculable sufferings”. A curriculum vitae Wiesenthal completed after the war does not mention his work for the Americans but lists his occupation as the vice-chairman of the Jewish Central Committee for the US zone, based in Linz. Its task was to draw up lists of survivors that other survivors could consult in their hunt for relatives. For at least a year after the war, Wiesenthal’s other task was to lobby hard for his fellow Jews; he became president of the Paris-based International Concentration Camp Organisation. He also forged contacts with the Brichah, which smuggled Jews out of Europe to Palestine. It was not until February 1947 that he formed the organisation that would make him famous, the Jewish Historical Documentation Centre in Linz. Its aim was to collate information on the final solution with a view to securing the indictments of war criminals. Wiesenthal claimed to have started it because of an anti-Semitic remark made by an American officer, which made him realise that the allies would never hunt down the Nazis to the extent that was required. Sadly, he was to be proved right. He and his band of 30 volunteers travelled around the displaced persons’ camps, collecting evidence on the atrocities from former concentration camp inmates. In all, Wiesenthal’s team compiled 3,289 questionnaires, which is a far more impressive feat than anything the allies achieved. Wiesenthal died in 2005 at the age of 96 and was buried in Israel. The tributes and eulogies were many and fulsome and at the time it would have been churlish to have detracted from the many positive aspects of the role he played. He was at heart a showman and when he found a role as the world’s head Nazi hunter, he played it well. As with so many popular performances, it was impossible for the critics to tell the public that the Great Wiesenthal Show was little more than an illusion. Ultimately, it was an illusion mounted for a good cause.